Aug. 31. Sunday, P. M. — To Hubbard Bath Swamp by boat: "There sits one by the shore who wishes to go with me, but I cannot think of it...He thinks I could merely take him into my boat and then not mind him. He does not realize that I should by the same act take him into my mind, where there is no room for him, and my bark would surely founder in such a voyage as I was contemplating," Journal (1856). Explore all things Emersonian at the Emerson Society. Visit the Old Manse in Concord, maintained by the Trustees of Reservations. 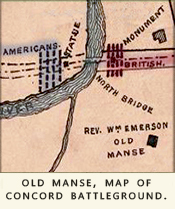 Learn more about the Old Manse from the National Park Service. 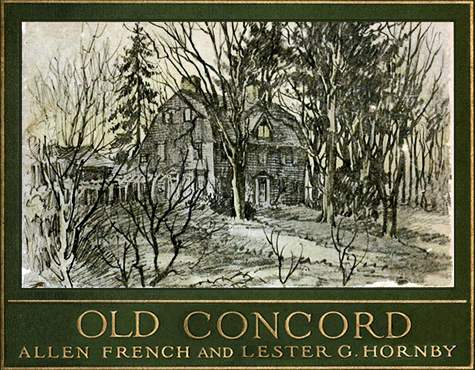 Explore the literary history of Concord at the Concord Free Public Library. Learn more about the history of boating on the Concord and Assabet Rivers. Built in 1770, the Old Manse stands steps away from the Old North Bridge where, in 1775, the "shot heard round the world" signaled the start of the American Revolution. The house was occupied first by Rev. William Emerson, grandfather of Ralph Waldo Emerson, then, after William Emerson died while serving as a chaplain in the Continental Army, his widow, Phebe Bliss Emerson, married Rev. Ezra Ripley, and the family made their home here during Ripley's long tenure as minister at First Parish in Concord. Ralph Waldo Emerson lived in the Old Manse from 1834 to 1835 while he drafted "Nature," which he published anonymously in 1836. Widely recognized as the founding text of American Transcendentalism, "Nature" attempted to define the spiritual dimensions of the relationship between the individual and the universe in order to recognize both as manifestations of the divine. The essay established Emerson as a preeminent voice in intellectual circles and intensified public attention when he was invited to speak before the Phi Beta Kappa Society at Harvard in August 1837. In his oration, "The American Scholar," which Oliver Wendell Holmes famously described as "our intellectual Declaration of Independence," Emerson announced that the men and women of letters in the U.S. had come of age since the founding of the Republic and thus their "long apprenticeship to the learning of other lands" had reached its end. Animated by direct and spontaneous interaction with nature as it was embodied in the sublime landscapes of the New World, "We will," he proclaimed, "walk on our own feet; we will work with our own hands; we will speak our own minds." We do not know for certain whether Thoreau, who had participated in the commencement exercises of the graduating class the day before, attended Emerson's address. However, the open-air scholar portrayed in the speech so closely resembled Thoreau that it seems inevitable that the two would develop a deep and mutually transformative friendship. It is clear that Emerson, who was fourteen years older, began to act as Thoreau's mentor around this time, but precisely when they first became personally acquainted appears to be impossible to fix in view of their innumerable opportunities to interact in the course of day-to-day life in Concord. Records show that Thoreau checked Nature out of Harvard Library twice during the spring of 1837, but he was by that point already well aware of Emerson as a literary light. When, for instance, Emerson's "Concord Hymn" was sung for the first time on April 19, 1836, Thoreau participated as a member of the choir. In 1842, six years after Emerson had moved with Lydia Jackson, his second wife, to his own house on Concord Turnpike, Nathaniel and Sophia Hawthorne took up residence in the Old Manse. When they arrived at their new home, they found that Thoreau and Jack Garrison, a local laborer, had planted a garden for them as a wedding present. After dinner...[we] walked up the bank of the river, and at a certain point he shouted for his boat. Forthwith a young man paddled it across, and Mr. Thoreau and I voyaged farther up the stream, which soon became more beautiful than any picture...Mr. Thoreau managed the boat so perfectly...that it seemed instinct with his own will...Nevertheless he was desirous of selling the boat of which he was so fit a pilot, and which was built by his own hands; so I agreed to take it, and accordingly became possessor of the Musketaquid. I wish I could acquire the aquatic skill of the original owner." 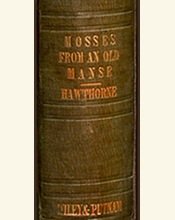 When Nathaniel Hawthorne took a job as Surveyor of the Salem Custom House, the couple moved away from Concord, but the three years they spent here were immortalized in "Mosses from an Old Manse," an essay published in various collections of his shorter works starting with a two-volume edition issued by Wiley and Putnam in 1846. The Hawthornes later returned to the town, taking up residence in "The Wayside," which had formerly belonged to the Alcotts, but the intense joy of their early married life as chronicled in "Mosses" forever linked them with the Old Manse, one of the richest fields of Concord history. Centennial Map of Concord, Leventhal Map Center at the Boston Public Library. Learn more about Rev. 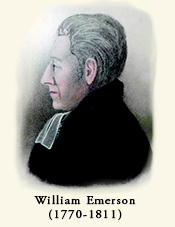 William Emerson, Pastor of First Church in Boston from 1799 to 1811. 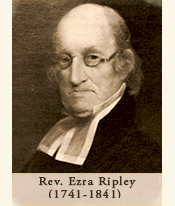 Learn more about Ezra Ripley, Pastor of First Parish in Concord from 1788 to 1841. 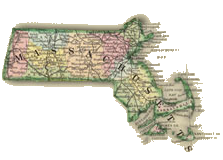 Learn more about Sarah Ripley, resident of the Old Manse from 1846 to 1867. 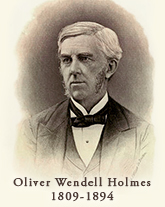 Read Oliver Wendell Holmes on "Nature" and "The American Scholar." Read Herman Melville's laudatory review of Mosses from an Old Manse.